Please refer to our stock # R236 when inquiring. Edo Period late 18th/early 19th Century Japanese Ningyo of Yamauba, the Forest Goddess, half woman and half spirit. She found Kintaro abandoned in the forest by his father, and saved his life. She raised him, and he became the Hercules of Japan. For sure one of the rarest of all Ningyo. Also the rarest of female images. Only a few of these may actually exist. She bares her breasts to nurse Kintaro, as seen in Japanese woodblock prints as a popular subject by artists such as Utamaro. She is holding a wild peach branch and Kintaro is in a sumptuous silk textile matching her Obi. She is wearing gorgeous textiles and beautiful tied hair of silk. 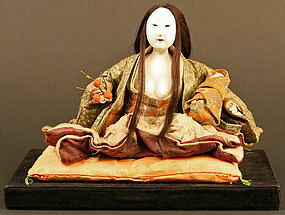 Her face and bust are of the highest quality burnished gofun, creating her beautiful spirit face. She is sitting on a peach silk pillow. Displayed on a fine black velvet display stand. Overall dimensions: 11.5 x 8 x 8 inches, 29 x 20.5 x 20.5 cm; Yumauba: 10 x 7 inches, 25.5 x 18 cm. Fine Condition.